Few can match Navigators in charting hyperspace passages or plotting overland routes. For these Seekers, a journey's final destination is less important than the methods used to reach it. 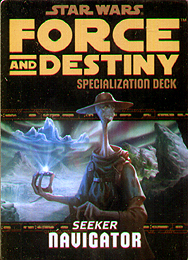 This deck requires the Force and Destiny Core Rulebook and Savage Spirits. It includes cards for all 20 talents available in the Navigator specialization.